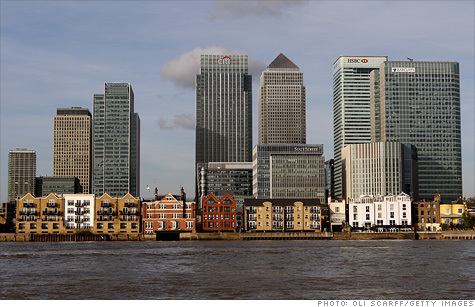 London's Canary Wharf neighborhood, a financial hub. NEW YORK (CNNMoney) -- It affects everything from mortgages to credit cards to student loans, and now some of the world's biggest banks are at the center of a criminal investigation into whether they manipulated it for their own benefit. The London Interbank Offered Rate, or Libor, is a measure of the cost of borrowing between banks that serves as a benchmark for over $350 trillion worth of financial products worldwide. Higher Libor rates translate into higher borrowing costs for businesses and consumers, while lower rates could make lenders reluctant to lend since they can't charge as much in interest. In addition to consumer loans, certain bonds and interest rate swaps also use it as a benchmark. With all the different loans and investments tied to Libor, there are serious consequences if the process is tampered with. "If you move it even a little bit, it can cause massive redistribution of resources because it's so extensively used," said Rosa Abrantes-Metz, a professor at New York University's Stern School of Business and a former economist with the Federal Trade Commission. Last week, the Justice Department said in a letter to a federal judge that it was conducting a criminal investigation of alleged Libor manipulation. Officials in Switzerland, Canada and the United Kingdom are also looking into the issue, according to disclosures in several banks' public filings. In addition, a number of banks, including Bank of America (BAC, Fortune 500), Citigroup (C, Fortune 500), HSBC, JPMorgan (JPM, Fortune 500) and Credit Suisse (CS), are defendants in a U.S. civil case brought by investors -- ranging from mutual funds to individual traders to the city of Baltimore -- who say they lost profits due to Libor distortion as far back as 2006. Law enforcement officials and the banks targeted in the suit either declined to comment or did not respond to requests for comment. How Libor works: Libor rates are set each business day through a process overseen by the British Bankers' Association. Between seven and 18 large banks are asked what interest rate they would have to pay to borrow money for a certain period of time and in a certain currency. In all, the process generates rates for 10 currencies across 15 different time periods, ranging from one day to one year. The responses are collected by Thomson Reuters, which removes a certain percentage of the highest and lowest figures before calculating the averages and creating the Libor quotes. Banks trying to appear stronger and more creditworthy may have been tempted to submit lower numbers, particularly during the financial crisis. In addition, if the banks coordinated their submissions, they could adjust trading positions tied to Libor in order to profit from their advanced knowledge of its movements. "The banks involved in this were largely trusted by the public to be setting these rates in a fair way -- it was supposed to be a transparent measure of the cost of borrowing," said Arun Subramanian, a lawyer representing plaintiffs involved in the civil litigation. "To the extent that the banks were colluding to manipulate these rates, everyone was harmed and the public trust was violated." No banks have been formally accused of wrongdoing in the United States. However, Japanese regulators temporarily suspended some transactions by UBS (UBS) and Citi in December after it was revealed that traders at both banks attempted to influence yen Libor rates and the related Tokyo Interbank Offered Rate, or Tibor. UBS also recently revealed in public documents that it was providing information to U.S. and Swiss officials investigating possible Libor manipulation in exchange for leniency and conditional immunity, depending on the jurisdiction. There's no telling how long all the various probes will take to resolve, but if the allegations are proven, liabilities could be in the billions, said Jonathan Macey, a professor at Yale Law School. There's also the possibility of criminal charges should conspiracy among traders be established, as well as the potential for more lawsuits from private plaintiffs. "It's a very serious issue when you're talking about banks manipulating these rates across the globe," Subramanian said. "I think the liability for the banks is going to be staggering."